How are you all? I feel like I haven’t seen you in ages! This is what skipping blog days does to me – I miss you! So let’s see… What have I done in the past week? Gee, I wonder what would do the trick? Snickers Peanut Butter Brownie Ice Cream Cake! 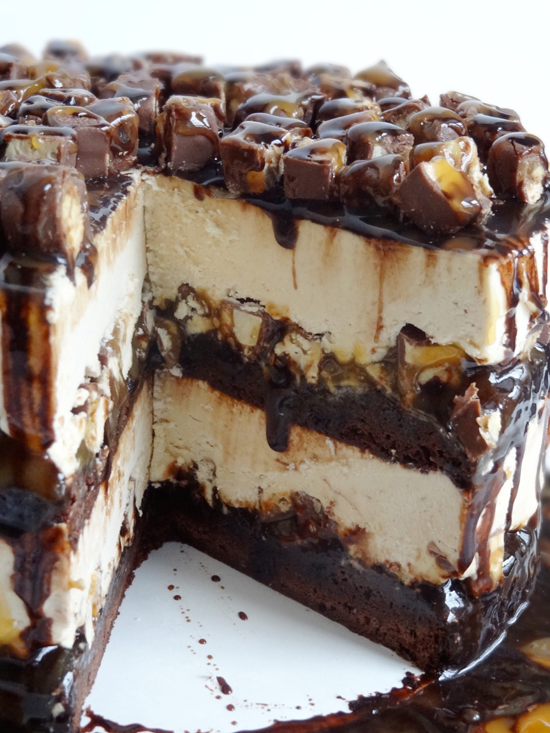 And seriously, how could anything be better than Snickers Peanut Butter Brownie Ice Cream Cake? It has Snickers – indisputably the world’s best candy bar YUM! – brownies – YUM YUM!! – and ice cream – YUM YUM YUM!!! and perfect for summer! Adeline K. Strauss has a problem with monsters in her house. Could there be a way to win over these “bad guys”? In The Bad Guys Breakfast, Addie discovers the way to a monster’s heart might just be through his (or her) stomach. So, she invites them for breakfast. But when a witch, ghost, shark, and bear (…and maybe more) show up at her doorstep ready to eat, things can go only one of two ways. Now accepting pitches for September! For rules and where to submit, click on this link Would You Read It or on the Would You Read It tab in the bar above. Polish up your pitches and send yours for your chance to be read by editor Erin Molta! Stacey is looking forward to your thoughts on her pitch! I am looking forward to trying out that Snickers Peanut Butter Brownie Ice Cream Cake recipe! 🙂 Oh, and I’m also looking forward to attending the NJ SCBWI conference this weekend! I’ve never been before, but I’ve heard tell it’s awesome, and I think quite a few people I’m anxious to meet in real life are going to be there. Anyone going? Let me know in the comments! Would You Read It Wednesday #138 – Immortal Island (YA) PLUS Straight From The Editor! Thanks for your great suggestions for Stacey, Vivian! And hmm… are you by any chance on the way to Maine? Maybe we could take a small detour 🙂 I'm so glad you like Mr. Wuffles! David Wiesner is amazing, isn't he? If you make the recipe, Rosi, let me know how it turns out. I don't dare – I'll eat too much cake 🙂 Thanks for your comments for Stacey! Disclaimer: We are not affiliated with ISKCON in any way whatsoever. ISKCON, or “The Hare Krishna Movement” as it's popularily known, is a radical and extremist distortion of the original Radha and Krishna dharma from ancient India. The author of the above book Bhavanasara Sangraha is no longer affiliated with ISKCON either, having cut all ties to ISKCON a few years ago.
. ,. . . ,. ,.